Children love to go with their parents to a country house. This is an opportunity to visit the nature, sunbathe and splash in the river, frolic with friends, eat strawberries, apples and currants. But if you do not have a summer house or it is not the season now, the Family Farm game will replace it in full. This is a very beautiful toy in a cartoon style, where every detail looks colorful, in rich colors, with clear graphics. 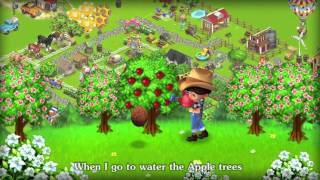 It is designed for entertainment on a computer, but it can also be installed on Android, so that you can always have a pocket farm at your fingertips, and Family Farm to play as soon as the moment comes. Now your friends are always there, because browser games are built in such a way that real players stay at the same time, controlling their lands and communicating online. Here you will meet new people and make friends, even if they live on the other side of the Earth. To start you need a family farm registration to get access to all the features of the gameplay. Surely the procedure is known to you: we inform the e-mail, invent a password and name in the game, entering the data into the proposed registration form. The main thing is to remember the password and name in order to enter the account from any computer. Of course, you need to keep them secret so that besides you no one can penetrate your page. For convenience, place the fields and production facilities side by side so that the milk can be immediately turned into sour cream, cottage cheese, cheese. Build mills and bakeries with a wheat field. Soon your plantation will look well-groomed and neatly divided into sectors, between which there are paths of pebbles, flowering bushes and fruit trees are spread. Don't forget that iPlayer Family Farm is a simulator, so everything is believable here. If the plants are not watered, they will disappear, and you will not be able to complete the harvest. This will entail other problems - the lack of raw materials for processing and the finished product. And if you have not completed the task - you will suffer losses. But on the other hand, for the goods sold, you will receive gold coins, bonuses and prizes, thanks to which you will be able to advance to the next game stage, where new buildings and opportunities will open. Let the game look simple, but it is a deceptive feeling. You need to make an effort to achieve the desired result. Let your pens and do not get dirty earth, work on it to be a lot. And when the economy expands, the main assistants will be new mechanical, improved acquisitions. Compete with other gamers in farm performance, make horseback riding, earn more than others. Beginners will undergo introductory training, which will explain the nuances and help them to settle. Further control passes to you, and all errors with achievements depend on you.